Bishop Michael Curry delivered a soul-stirring sermon at the royal wedding of Prince Harry and Duchess Meghan. The BBC estimates that nearly 2 billion people tuned in to watch the ceremony. If you have not heard the 13-minute message, listen here or read the transcript (but you should listen because that man can preach!). His message of God’s love was hopeful and almost wonderful. I say almost wonderful not because I could find any flaw in his presentation, but because there was an essential truth absent from his message—why Jesus really died. Jesus would say that the Bishop told the truth, but not the whole truth. And the part he left out is essential to understand what love really is. Jesus didn’t die just to give us an example of love; He died to forgive our sins. If we’re going to talk about love, we must talk about true love—that the sinless Son of God died a gruesome death to take the judgment sinners like you, me, Bishop Curry, the Prince and Princess, and everyone else watching deserved. Jesus did not die to warm our hearts or inspire us to feel love toward others. Jesus died because we did not love God and are destined to an eternity apart from Him in judgment. The Scriptures tell us, “God so loved the world that He gave His one and only Son, that whoever believes in Him shall not perish but have eternal life” (John 3:16). Jesus would say that you could be moved by the Bishop’s message about love, but if it does not lead you to confess and repent of your sin and cling to Jesus by faith alone—the judgment of God rests upon you. Some may suggest what I’ve written is the exact opposite of the love the Bishop was calling us to celebrate. But that’s just not true. True love tells the whole truth, and that is what Jesus came to do. He came to show us love by dying for the sins that keep us away from God’s love. The Bishop preached what may be one of the most broadly viewed sermons in history. He did it in a compelling way. But the heart of what Jesus did was omitted. Jesus did show love, but a particular kind of love—sinner-saving, God-magnifying love. Some will surely be frustrated that I would give a critique of a moving message on such a historic occasion. I get it, but here’s the deal—there is nothing more important than rightly understanding what God’s love is really all about. If you were moved by what the Bishop said about love, you should be. But Jesus would say the bishop left out the best part. Jesus’ love is seen at the cross where He died for people who do not deserve it. He then rose from the dead and calls former rebels to become His bride who know His love and show His love to all people. And the news gets better! There is a fast approaching Day when Jesus will return to take His beloved bride to Himself and celebrate a great wedding feast in heaven with her. Today He has given good news that if you will turn from the sin He died for, you will be invited to that Royal Wedding in glory—not as a guest, but as the bride. May God bless the Prince and Princess in their new marriage and all the days He gives them together. And may He help us all to forever delight in His amazing love. This entry was posted in Social Issues on May 19, 2018 by garrettk. Sadly the bishop preached as if all in attendance were Christians, and that what he said about if they loved then God was living in them. I agree with you he missed the Mark by not being preaching the full gospel. The world was taken by his style more than anything else. Pity too that he believes being gay is acceptable, and that women can take authority over men. For the woman which hath an husband is bound by the law to her husband so long as he liveth; but if the husband be dead, she is loosed from the law of her husband. So then if, while her husband liveth, she be married to another man, she shall be called an adulteress: but if her husband be dead, she is free from that law; so that she is no adulteress, though she be married to another man. Jesus also said: “Do not judge according to appearance, but judge with righteous judgement,” John 7:24. It is right to judge, but it mustn’t be self-righteous or hypocritical. God’s word proclaims certain behaviour to be sinful. It is therefore right for Christians to uphold the truth according to the Bible. He did, but it didn’t mean “do not discern, do not evaluate”. Otherwise, do you think that Jesus broke his own commandment when he spoke negatively about others? He said that at the beginning of Matthew 7 (with qualifiers attached) and then He instructs us to beware of false teachers just a few verses later which requires discernment. I would comment that you are entitled to your interpretation of the message Bishop Curry brought this morning. I would comment that you entitled to your opinion regarding what Bishop Curry should have said, or should have not said as the case may be. Finally, I would comment that you are NOT entitled to say what Jesus would have or not have said. Why? You are not Jesus. You are not God. You may SPECULATE as to what Jesus may or may not have said regarding Bishop Curry’s message, but you CANNOT (as in your words “Jesus would say”) declare what Jesus would have said. You are not in a position (as far as I can see) to say “Thus Says the Lord”. And btw, the full Gospel is the death, burial, and resurrection of a sinless Jesus for sinful man. Just so you dont think I espouse a different Gospel. This is an excellent comment! Thank you for your thoughtfulness. I feel the same trepidation which is why I attempt to root all of it directly in Scripture. If you feel like I’ve missed this, I’m happy to hear more. Thanks for your important concern. You showed what Jesus DID say regarding this wedding speech. I thank you for pointing to God’s Word brother. Thank You for a great explanation! Well said, Garrett. My response to hearing the bishop was the same as yours: he stopped short of telling all the truth. Thanks for suffering the inevitable slings and arrows by speaking up. Hmmm…I understand your point, but it was a wedding after all, not a true sermon. I think he got by with sharing a lot considering the Queen thinks such messages at weddings should be no more than 2 minutes. I’m not sure this criticism was necessary. Liz, do you have a source for your view that the Queen expects such messages to be 2 mins? I can assure you I’m a reformed evangelical Christian in the Church of England and my pastor is one of the Queen’s chaplains and I’ve never been aware of this! I thought it was necessary bc so many people saw currys message and the gospel according to curry is that Christian love is equated to toleration and acceptance of lifestyles that are culturally accepted but where Gods word calls these sinful. 1 Cor 13 says love delights in truth and truth is of God. And Gods love was such that He is even willing to forgive us when we abandon His truth. Currys camp is attempting to dismantle this message in whole. I personally believe that the gospel is the very best ingredient for truly solid loving marriages! Excellent response! Yes, it was a beautiful message but that missing element of why Jesus died was like omitting the climax; in fact did. He also referenced a French Jesuit, whom I assume to be Pietre Teilhard de Chardin. Teilhard was a dangerous heretic, a pantheist reinventing Christ to accomodate a cosmic evolutionism. Beware when all men speak well of you…. Everybody preaches a ‘part’ another the ‘other part’ due to limitations of time, space and knowledge. Only God is Omniscient. Preach your part and humbly appreciate the part of that other preacher preaching according to the grace given to him/ her. He preached the part that nobody minds hearing and which isn’t sufficient to know our need of salvation. He left out the part that we need to hear so that we can avoid going to hell. The first century Pharisees also found fault with Jesus\’ message and persuaded the Romans to crucify Him. So the question is are you going to judge like the Pharisees or love like Jesus? William, given that you think it’s valid to critique Garrett’s post, your response is self-refuting: apparently, you do believe that valid criticism exists. Actually, the Pharisees often questioned Jesus, and they definitely rejected him. However, I’m not sure that I can think of a passage of the top of my head where they outright critised him, especially not in public. Jesus however, judged the Pharisees (a lot). Just read Matthew 23. At the risk of sounding like a nitpicking Britisher she has not in fact become ‘Princess’ Meghan. But a Duchess. Thanks, someone else corrected that as well. Appreciate the help. Thank you for this thoughtful analysis. I personally think that if you don’t preach the gospel of Christ, if you stop short of the gospel or twist your words to create a easily palatable message, you might as well call yourself a motivational speaker (not a preacher). Those guys never step on anyone’s toes. But the true gospel is convicting, which is not always comfortable, nor should it be. It rubs against the grain of our fleshly selves, until we are forced to realize that Jesus is the Son of God who died on the cross, bearing our sins that we might be reconciled to God. Perhaps we shouldn’t expect the gospel to be the focus of a wedding ceremony. Many have preached 1 Cor 13, as a treatise on love. But to say or imply that Christ died solely as an example of love is dishonest. It diminishes Chrit, God, and true believers. And it greatly does a disservice to the lost. To get excited that a person of color was part of the ceremony is to ignore who this Bishop Curry is, and based on this sermon, as well as his support of gay marriage clearly shows him not to be a man of God. If all who are criticizing the preacher could really do better than him, then it would have been them up there preaching and not him. We are all weak and perishable containers. Paul himself said, “But I keep under my body, and bring it into subjection: lest that by any means, when I have preached to others, I myself should be a castaway.” (1 Cor.9:27). Maybe where Bishop Michael Curry hasn’t “kept under his body” is his position on supporting gay marriages. Hence, you should pity and intercede for him. Yes, we should proclaim truth but real truth is not without grace. The grace that saved, poor, pitiful, and perishing you, Michael Curry, and myself. Jesus was “full of grace and truth”. (John 1:14). Yes, “the grace of God that bringeth salvation has appeared to all men, TEACHING us..” (Titus 2:11-14). But, “As thou knowest not what is the way of the spirit, nor how the bones do grow in the womb of her that is with child: even so thou knowest not the works of God who maketh all.” (Ecc.11:5). Daniel W. Whrittle in His hymn, “I know whom I have believed” said, “I know not how the Spirit moves, convincing us of sin, revealing Jesus through the Word, creating faith in Him.” But everyone who has been quick to criticize Michael Curry and his message do know! And that’s why they have been quick to criticize and conclude on him. The very nature of who God is and how He works should terrify and humble you! God caused a storm in judgement against Jonah, and when he was thrown into the sea and should perish, God caused him to be preserved in the belly of a whale. And later Jesus would reference this disobedient prophet, that just as he was in the belly of the whale for 3 days and 3 nights so will the Son of man be 3 days and 3 nights in the heart of the earth (Matt 12:40). The sermon preached at the Royal Wedding did not sound like it came from someone who supports gay marriage. Elton John certainly wasn’t happy (by the looks on his face)! The message was anointed- it wasn’t a dry, lifeless, fit your doctrinal straight jacket- yet dead, type message. It shocked, mezmerised, angered, gladened, and though left some confused- they could not escape the heart of the message – “God is love”. You can criticize the message, but it cannot be denied that it was challenging. God can use the message to bring many into the Kingdom of God (this has been our prayer). As someone rightly tweeted: “Bishop Michael Curry took the world to Church.” Ed Miliband former Labour Party leader nearly echoed the words of King Aggrippa gripped by Paul’s preaching: “Rev Michael Curry could almost make me a believer.” (Acts 26:28). It may appear funny, but we need to understand what God can do when a statement like that can be made. Let us intercede for Bishop Curry, and most importantly pray as well that God will use his message to bring as many that heard into the Kingdom of God. The sower sowed the seed. He said that Jesus died for others and showed his love as a result. Not making it clear as to why His death was for others was a huge omission. Love is not to be worshipped. Jesus is. God is Love is not the same as Love is God. One of the few times my family has ever come to a church service was during my mother-n-law’s funeral and I did NOT agree with the way it was preached. I was very upset and spent a lot of time crying because I felt like they heard a distorted gospel. I had been praying for them for so many years and it really got to me. I’m all that anxiety I felt Jesus softly and sweetly reminding me that He is the one who opens our eyes and He can use even the messiest of messages from sinners like us to open our eyes to His grace. Again, I completely understand where this post is coming from, but I’m just not sure how helpful it is. We don’t know his heart and we don’t know what others could have heard. I just don’t believe we can say what Jesus would have said about this message. But then again, I’m not a seminary grad. I’m just a mess who loves Jesus and is banking on Him using messed up people and messed up messages to bring His people to Himself. That’s really the only hope I have. I know He did it for me! Let’s all pray people would hear the truth of who Jesus is and come to Him! Ps- brother thanks for your passion and love for Jesus and the word and this post! I never comment on posts on the internet because I know it can just be hurtful so I hope you read this knowing I’m thankful for people like you who speak truth! What were we before we became the Bride of Christ? How do we fell about walking in that pure white garment that only Jesus has made possible through His blood sacrifice in dying on our behalf? Goodness, this was a wedding speech, not a Sunday morning revival sermon. The Spirit anointed TRUTH of God’s love was boldly proclaimed. The name of Jesus was exalted – high and lifted up! On a global stage! Jesus himself approached weddings with a celebratory spirit of love – turning water into wine! Bishop Curry did a beautiful job celebrating love and celebrating that our God IS love. There’s hardly room for such arrogant critique. Praise God it’s not our perfect words or meticulously crafted sermons that produce salvation – it’s the Spirit of God moving and working in individual hearts. Personally, I think the Spirit was MOVING on Saturday! Hopefully all Christians can agree on a few things. One of those might be that Jesus is God’s only Son and that there will never be another Jesus or other Savior of mankind. Next, with Jesus being The Savior, a mention of Jesus in any sermon whether it be in an ordinary church service, funeral, baptism, wedding, etc, would obviously include dialogue pertaining to his Saving Grace. I respectfully must say that the bishop did seem to touch on Grace, but I find no way to convict him of using verbiage about the role of The Savior. The birth, death, and resurrection of Jesus defines The Savior. Further, my own personal belief is that there will likely never be another Billy Graham. 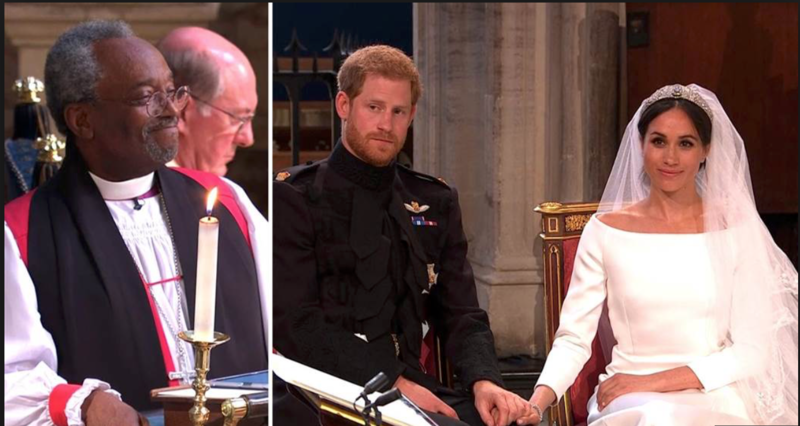 I am a Protestant but I found myself watching the royal wedding with a recurring thankfulness that the Catholic representatives involved in the service seemed to make so many references to God The Father, Jesus The Son, and The Holy Spirit. Hopefully the next time there is a chance for spreading The Gospel on the world stage, Christ The Redeemer ( vis-à-vis redemption from sin ) will have the spotlight— He is the only one deserving of such attention and focus to begin with. The reason some clergy do not mention sin is because their doctrine allows certain actions that were formerly considered sinful, to be practiced by their membership. A few years ago, Curry’s organization made history by something they allowed. I will not judge them for this because they define their own selves, just as Curry defined himself a few days ago. The truth of Jesus and the message of the gospel of the kingdom of God, is that we should change our minds (repent) and abandon our lives to him, and learn to walk as Jesus did, in obedience with his Father. He said ” I only do what my Father tells me to do “. Authentic Christianity is nothing short of Changing our minds about who Jesus is, Believing on him paying for our debt of sin (self centerednss) at the cross , Receiving the Holy Spirit ( comforter) and begin our new life learning the walk of obedience as Jesu did. His Grace, mercy ,kindness and Great love leading us every step of our Journey.! Psalm 23.